Homespun Stitchworks..... For the love of vintage: Time for a French Linen sort out! Recently I have bought a bit more and it has overspilled from a drawer to a box as well. I really do not need any more for a while BUT if I see a really good quality French linen sheet at the right price and some beautiful embroidery or monogram on it...... I am undone! Well I thought I would try and sort through today and put all whole sheets in the drawer and any cut or off cuts into the plastic box. Make sure they are all folded properly and in order. I have been cutting out a few as backgrounds for samplers and pictures that are in the making and when cutting one, you may as well cut a few more for when needed. Then I press them lightly and lay them flat for use. Hi Sarah, sorry to reply so very late to your message on my blog, I'm on a major blog break :) But yes of course you're welcome to share my "how to" message on the problem of joining blogs through google friend connect. No problem :) Hope it helps. 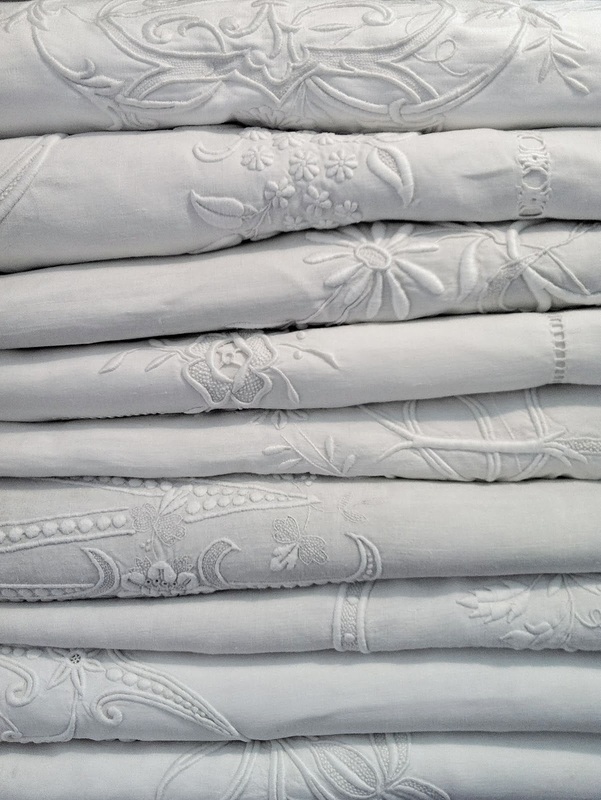 Loving the beautiful old embroidered linens, so gorgeous! Especially the white on white work, love it!